Over thirty years ago, the Food for Health Institute, with Yerba Prima, developed the first Internal Cleansing Program. Now, we have developed an improved, more powerful Mens Rebuild Internal Cleansing System based upon over thirty years of experience and clinical research. 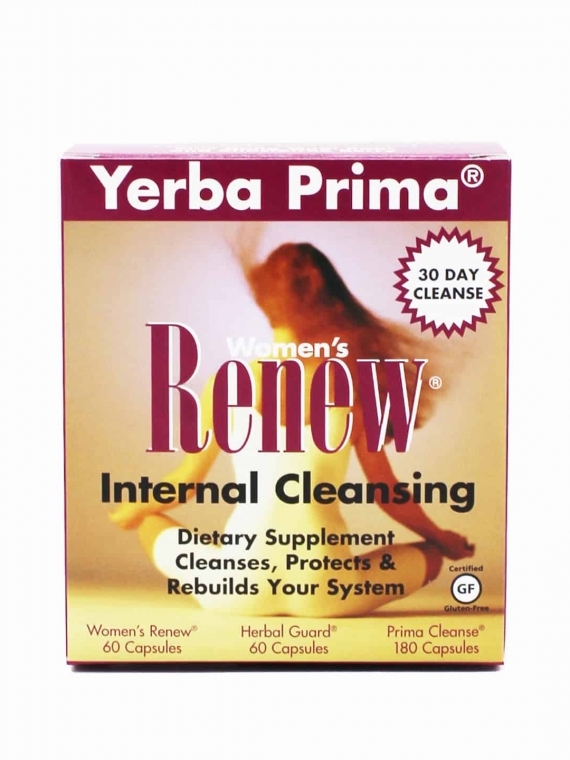 Yerba Prima Internal Cleansing includes the latest knowledge from Ayurvedic, Chinese, European and Native American traditions in a complete cleansing program. 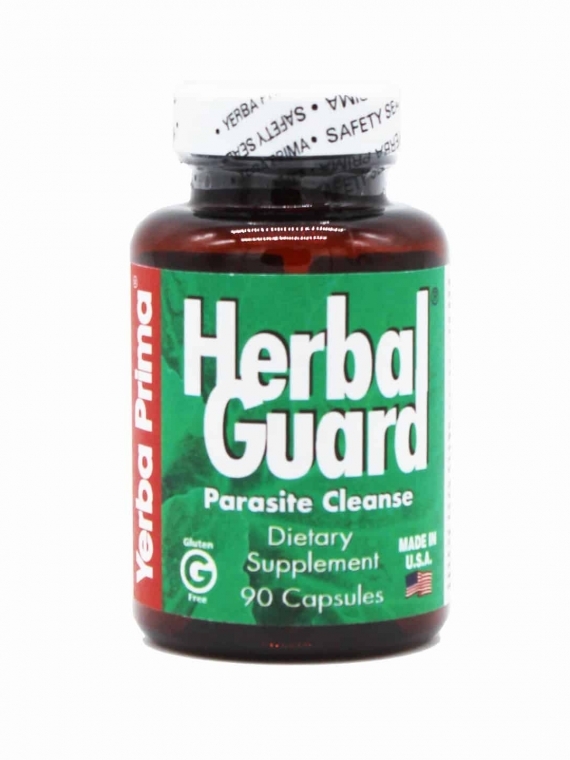 Only Yerba Prima Internal Cleansing includes Great Plains Bentonite for added detoxification. 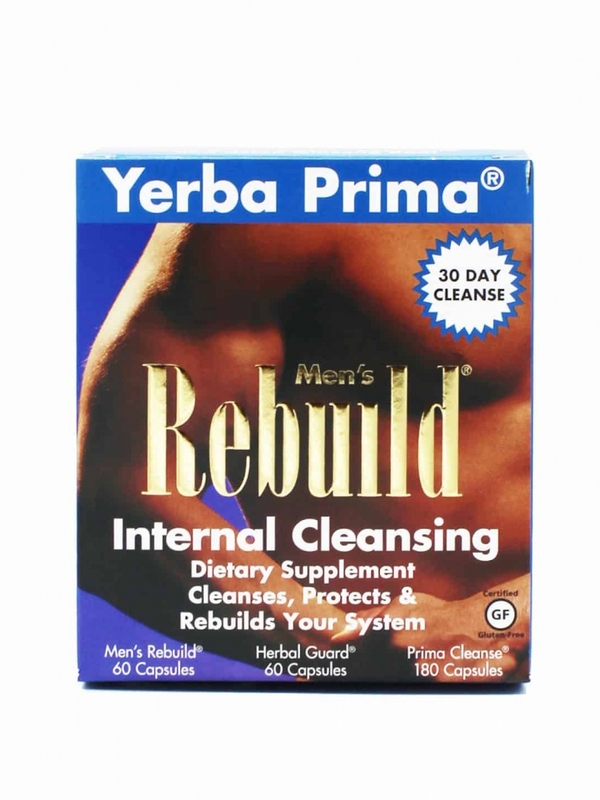 Men’s Rebuild Internal Cleansing System combines 30 of the finest cleansing and vitalizing nutrients from the worlds great healing traditions. It really works and is simple to use, whether you are trying internal cleansing for the first time or are an experienced user. Our more concentrated and powerful three-part herbs and fiber program gives a gentle yet thorough cleansing of the colon and the entire body. 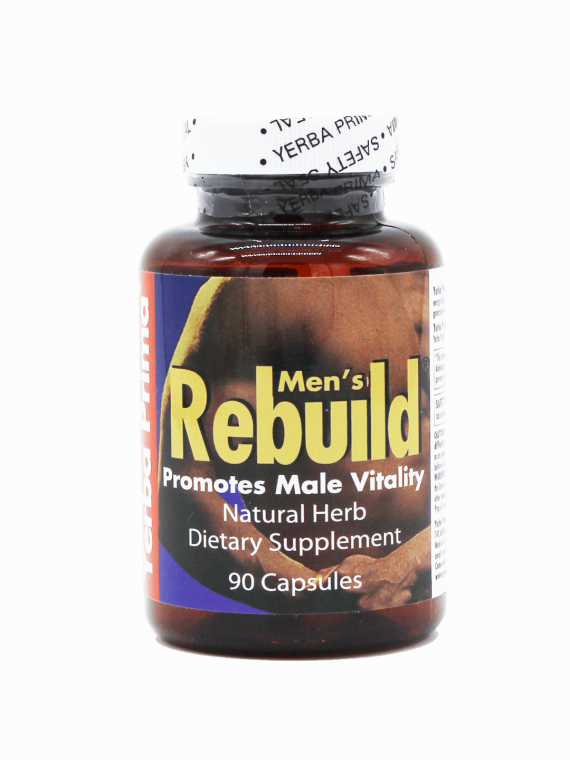 Men’s Rebuild ingredients help to protect vital organs throughout the cleansing process. Men’s Rebuild supports rebuilding of healthy digestive function and better assimilation of nutrients for better overall health and vitality, with special ingredients just for men’s health. 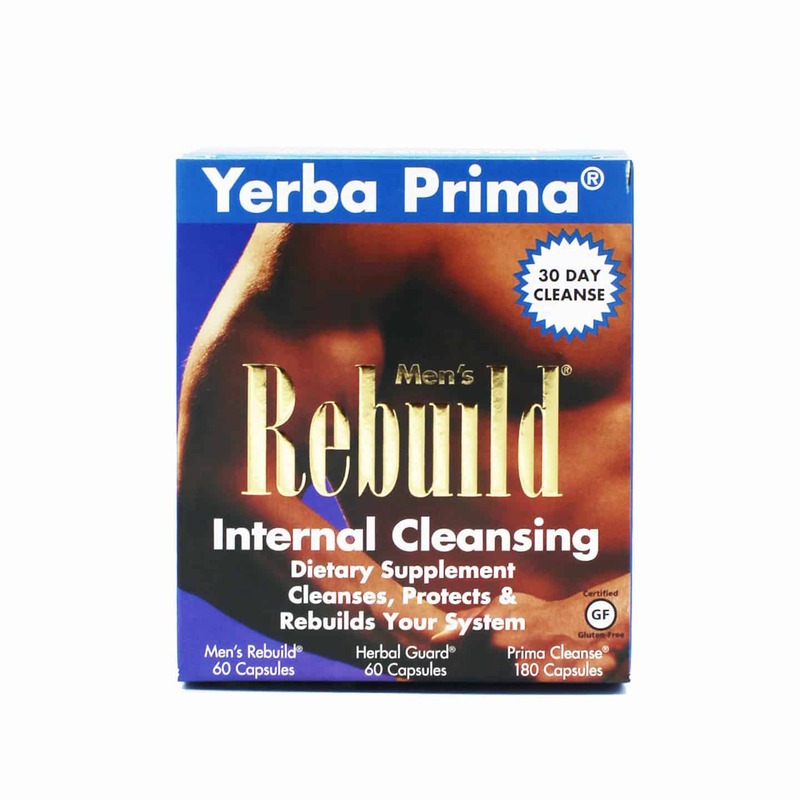 The Men’s Rebuild Internal Cleansing System consists of three products: Mens Rebuild, Herbal Guard and Prima Cleanse. Mens Rebuild is an easy program to follow, whether you are cleansing for the first time, or are an experienced user. 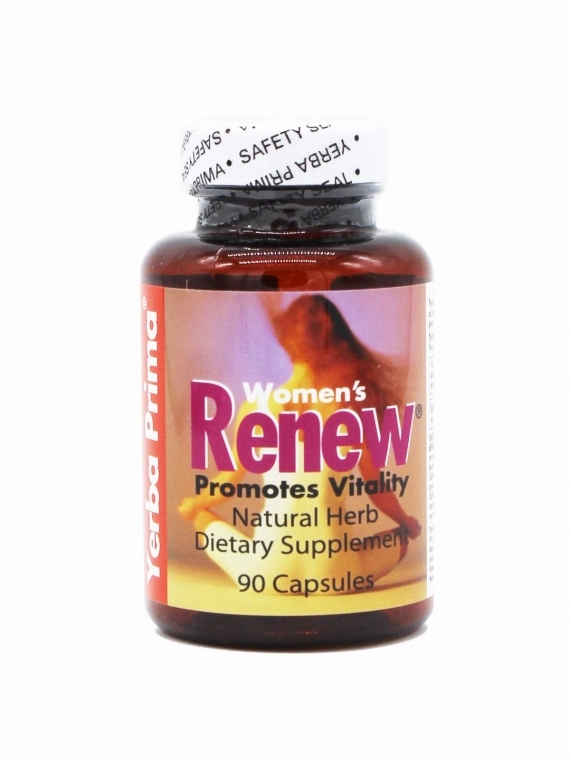 It provides a gentle, thorough, total body cleansing, plus protecting and rebuilding of the elimination systems. Take with food twice a day, morning and evening. Take each serving with at least 8 oz. (a full glass) of liquid. Drinking additional liquid is helpful. 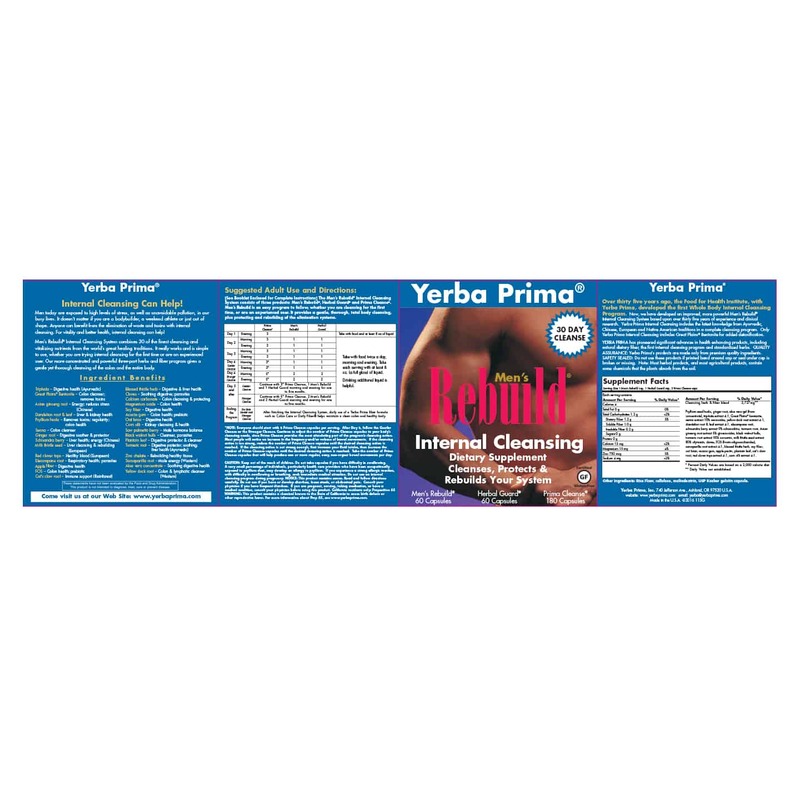 After finishing the Internal Cleansing System, daily use of a Yerba Prima fiber formula such as Colon Care or Daily Fiber helps maintain a clean colon and healthy body. *NOTE: Everyone should start with 3 Prima Cleanse capsules per serving. After Day 3, follow the Gentler Cleanse or the Stronger Cleanse. Continue to adjust the number of Prima Cleanse capsules to your bodys cleansing needs, since Prima Cleanse provides the most stimulating part of the programs cleansing action. Most people will notice an increase in the frequency and/or volume of bowel movements. If the cleansing action is too strong, reduce the number of Prima Cleanse capsules until the desired cleansing action is reached. If the cleansing action is not strong enough, first increase your fluid intake, then increase the number of Prima Cleanse capsules until the desired cleansing action is reached. Take the number of Prima Cleanse capsules that will help produce one or more regular, easy, non-urgent bowel movements per day. CAUTION: Keep out of the reach of children. Do not take capsules if you have difficulty in swallowing. A very small percentage of individuals, particularly health care providers who have been occupationally exposed to psyllium dust, may develop an allergy to psyllium.If you experience a strong allergic reaction, with difficulty in swallowing or breathing, seek immediate medical attention. NOTICE: This product contains senna. Read and follow directions carefully.Do not use if you have or develop diarrhea, loose stools, or abdominal pain. Consult your physician if you have frequent diarrhea. If you are pregnant, nursing, taking medication, or have a medical condition, consult your physician before using this product. Cleansing herb & fiber blend 2,727mg** Psyllium husks, aloe vera gel (from concentrate), ginger root, triphala extract 4:1, dandelion root & leaf extract 4:1, Great Plains bentonite, yellow dock root extract 4:1, elecampane root, senna extract 10% sennosides, schisandra berry extract 9% schisandrins, Asian ginseng root extract 5% ginsenosides, milk thistle seed extract 80% silymarin, cloves, FOS (fructo-oligosaccharides), sarsaparilla root extract 4:1.cats claw root, black walnut hulls, soy fiber, oat bran, acacia gum, blessed thistle herb, apple fiber, plantain leaf, goldenseal root extract 5% alkaloids, saw palmetto berry, red clover tops extract 4:1, corn silk extract 4:1. * Percent Daily Values are based on a 2,000 calorie diet. ** Daily Value not established. Other Ingredients: Rice flour, cellulose, maltodextrin, USP Kosher gelatin capsule. Yerba Prima, Inc. 740 Jefferson Ave., Ashland, OR 97520, USA Made in U.S.A. Yerba Prima 2013 This statement has not been evaluated by the Food and Drug Administration. This product is not intended to diagnose, treat, cure or prevent any disease.